At the end of the work week most of us just want to let loose and relax. I’m a work-at-home mom so the last thing I want to do is remain at home on Friday night while hubby comes home and all he wants to do is crack a beer and vegetate. It’s always a dilemma and sometimes the pizza place wins out. 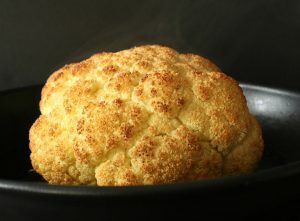 Even someone who loves to cook as much as I do can get tired of chopping, frying, roasting and photographing. It was Friday and I just wanted to go out and have someone else cook for me. On our way to the Calgary City core, every red light seemed to block our way and I was sure we weren’t going to make it through the front door for 6:30. It kind of felt like when you’re waiting for Christmas or how some people feel when the new iphones are released (not me I’m a droid girl!). Dinner at Charcut could not happen soon enough! Finally it was 6:31 and we were in the entrance of a very dark nature. The lovely front staff checked our coats and showed us to our extremely dark table. It was obvious that this corner table with a single light bulb really was the last table of the night. I wondered aloud to hubby, worried about how I was to take photos and then resigned myself to using flash, something I am always loathe to do in a restaurant setting. I couldn’t help but think of a similar situation I had witnessed some weeks ago during a week day restaurant visit to a place near our house. A man not far from our table rudely asked the waitperson if she had a flashlight so he could read the menu. The lighting at that restaurant was probably 30% lighter than our table at Charcut but I wasn’t going to whip out my phone and use its light to read the menu like he did. I was already worrying about disturbing other patrons with my camera flash. Let me start by saying again how dark this place is. The walls are black. The floor is cement and many of the accents are black. There are huge round lighting fixtures in a sort of centrally located area but the tables on the periphery (ours) miss out on their ambient light. Incidentally, we all decided that this particular light fixture reminded us of ‘the wheel’ a medieval torturing apparatus! Strange. We were also seated opposite the most beautiful cow painting. It’s not often you see such beauty in black and white and my daughter, who is an artist, explained that the painting was actually done with spray paint. The new cocktail menu looked absolutely delicious, but then again I never saw the old one so I have nothing to compare it to. My initial plan was to order one to start and another to finish my meal but by then I was so full I knew there wouldn’t be room for even another cocktail. 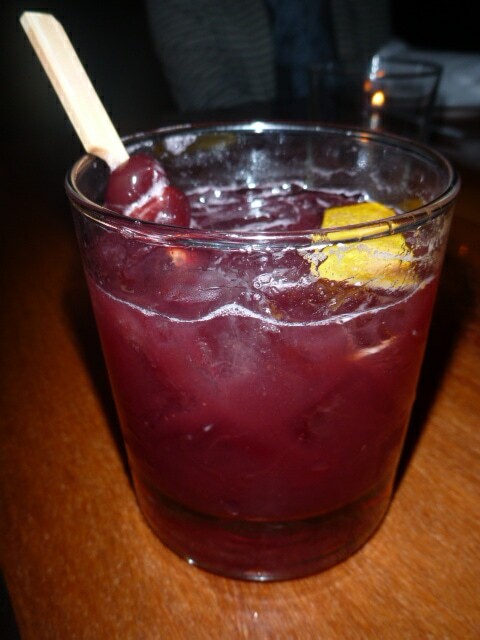 My cocktail started with a mixed drink of Port…..and finished off with cherry bitters. It was good, but I was expecting something a little sweet/sour. 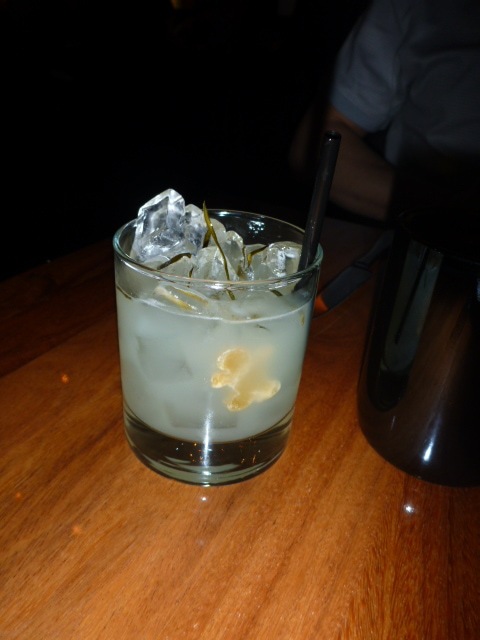 Hubby had the drink I was going to finish off with, the Ginger Gimlet. It was a delicious concoction of Bombay gin, ginger lime cordial garnished with lime leaves and candied ginger. We took a while to decide whether to dine ‘family style’ or individually. 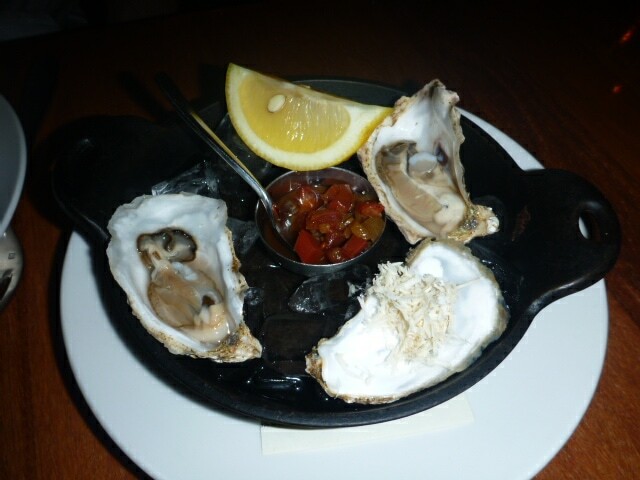 In the end, hubby ordered a couple of oysters to start. The came with a tomato ‘relish’, lemon and fresh grated horseradish. There were several dishes that I had heard were ‘must try’ and we had kid number two with us so we opted for the Share Burger with cheese curd. 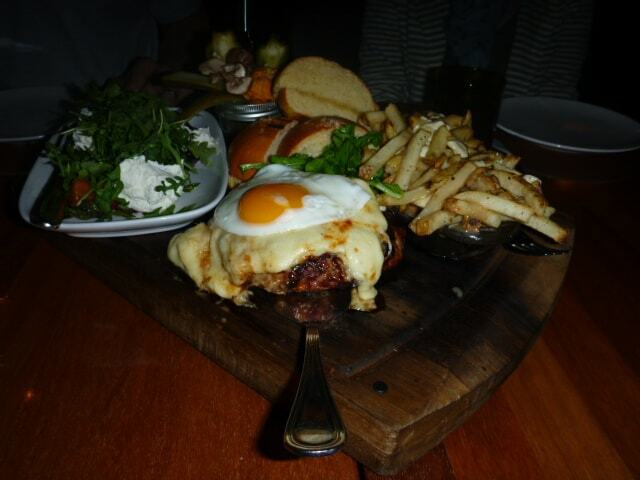 15 oz was definitely enough for the three of us, especially when paired with the Duck fat Poutine with Truffled Gravy. The burger had a delicious flavour but I found it quite salty. This was the only near ‘disappointment’ of the meal. A jar of pickles brought some acidic relief (though they were difficult to add to the huge burger) but maybe something like a tiny jar of red onion jam or a slice of pickled beet would provide some counterpoint to the burger. 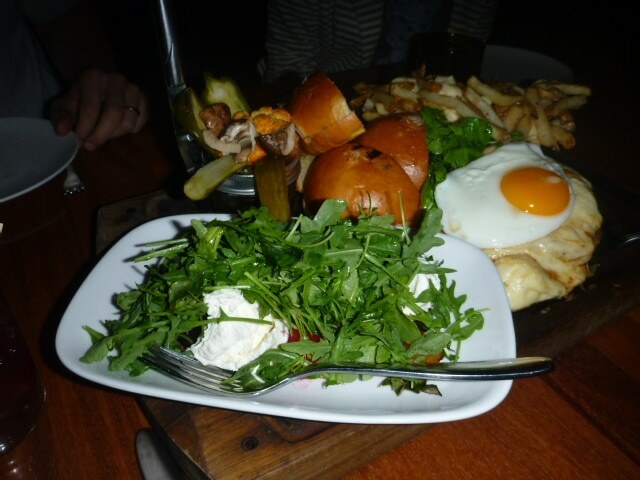 I absolutely loved the fried egg on top; something that we got used to on burgers in Australia as they are a regular addition to burgers there. Incidentally I asked our server Jeremy what the largest Share Burger ever ordered was and he said it was a full 100 ozs. It took 45 minutes to cook and was the size of the platter our whole meal was on. With that very heavy type of meal we thought we should also have some sort of portion that was good for us so we ordered the Slow Roasted Heirloom Beets. The house made goat cheese was so creamy and delicious and the arugula on top was so fresh. It was as arugula should be. Peppery and citrusy, unlike a lot of the bitter arugula you get at many places. The menu claimed there was mint and basil in the dish but I didn’t find any. The ingredients were all delicious individually but I found they needed some flavours to tie them together. We were absolutely full but couldn’t pass on the opportunity for something sweet to end our meal. 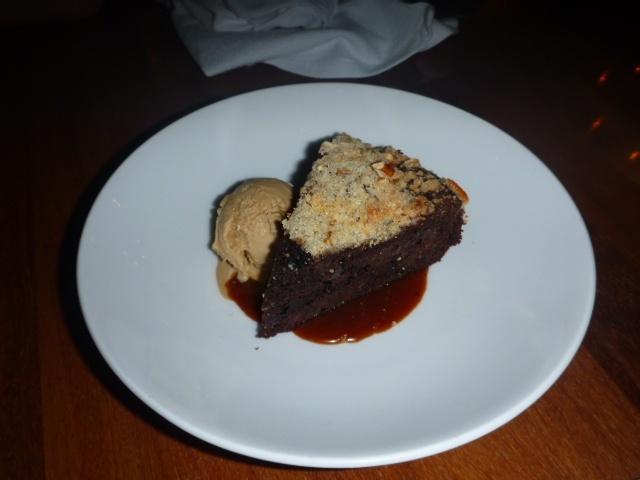 Kid number two was adamant that we order the Chocolate Crumb Cake with Stout Ice Cream and Salted Caramel Sauce. She obviously didn’t read the menu because she exclaimed that the ice cream tasted ‘like booze’ when she tried it. I thought it was oddly delicious! 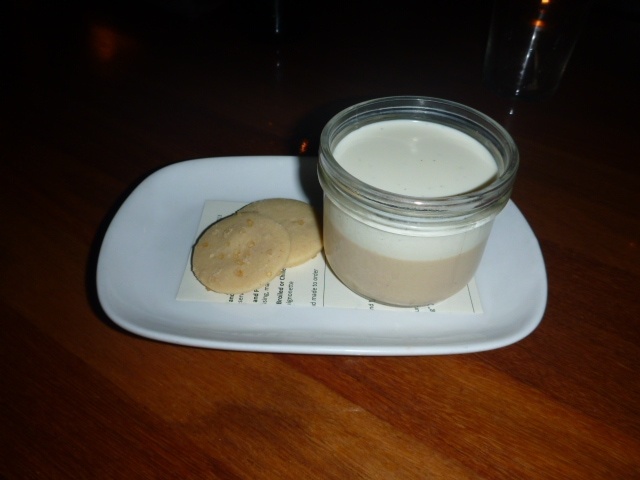 Hubby and I had our eye on the Maple Creme Panna Cotta with Salted Shortbread Biscuits. It was so unbelievably creamy and light. I would order it again for sure. It wasn’t too sweet at all, with just a hint of maple. Hubby and I also ordered duo espressos to go with our dessert but they arrived slightly before. I much prefer to have them with my dessert. Our server, Jeremy was very attentive and genuine. The drinks, food, and desert that we ordered really came out in record time. It probably had something to do with them wanting us out by 8pm but we didn’t really feel rushed until the very end when he briefly inquired about us moving tables to enjoy our coffee and desert. He was so nice about it that it wouldn’t have mattered to us in the least. In the end, he decided we could take our time and that it wouldn’t hurt the next party to wait 10 minutes. I like their food, but yes… it is a bit dark in there.